We all want to make our homes as nice as possible, but home renovations can be expensive. Not everyone can afford to hire a professional contractor and with the internet full of DIY tutorials, who needs them anyway? …These people do. These homeowners tried to renovate their homes themselves and things went terribly wrong. One guy now has his toilet paper roll holder in his shower. Sounds like a pain for him, but it’s sure entertaining for us. Brace yourselves, these home renovation fails will have you in tears laughing. Usually, garages are used to store one’s car and other personal belongings. For whatever reason, whoever designed this home elected to limit this garage to strictly storage. There’s no way this homeowner is getting a car in or out here. 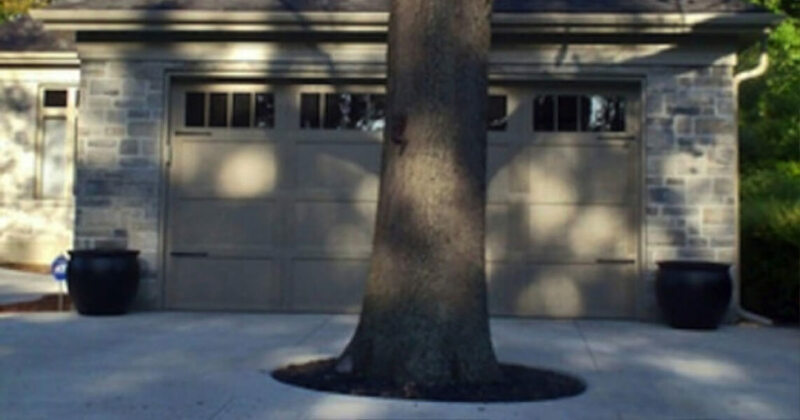 There is a massive tree in this person’s driveway. Unless this person was interested in preserving mother nature and not concerned with using their driveway to its full potential, this is probably one of the most questionable things you can see if you’re driving through a neighborhood.